In the Galaxy of careers, we are often dazzled and confused which one we should opt for. Wrong selection of career might cause repentance, frustration and lack of job contentment. So, we ought to be very careful in career orientation. Career orientation is a burning issue for most of us. We often think that what particular career we will like to adopt in life, in which career we can better establish ourselves. Many a times, we are not able to become what we aspire for, in spite of all the aptitude and ability for a particular profession, because we are destined for some other career in life. We attain a career in life either based on our aptitudes, potentials or as destined by luck for us. 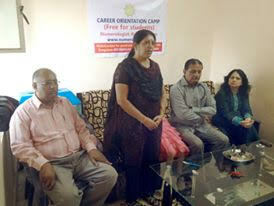 Birth number and luck number both play a vital role in our career orientation. You can either opt for a career according to your aptitudes and abilities and at times, you become in life what is in store for you due to Luck Factor. 1. Which career will be suitable for you as per your aptitude and abilities. 2. Which career you might get in life due to luck factor. 3. In which branch of study you will be selected and when. 4. When you will be settled and start earning. 1. When will be your next promotion due? 2. Will it be associated with transfer or you will remain posted in same city where you are already posted? 2. If you want to apply for transfer, in which period you should apply? 2. Chances of your getting settled in Film industry. 3. Whether you will establish yourself as an actor, director, photographer or script director? 4. Period of getting awards and honours. 2. Will political career be suitable for you? 3. If contesting elections, what are your chances of success? 4. What will be period of your glory in politics? You can avail readings in any one of these categories for INR 2100/- only. Career orientation counseling for students regarding which branch of study they should opt will be done for INR 1100/- only.